Skymap Global is one of Asia’s leading Earth Observation Analytics company on a mission to help you leverage data for everyday use. Remote sensing systems have been collecting massive amounts of Earth data for many decades. Today, rapid progress in computing and technology can help you make sense of this data for agriculture, forestry, business, economic development, energy and security. By combining multiple sets of data – from satellite, drones and IoT devices on the field, we can process, compute and employ machine learning and artificial intelligence to make sense of all this data and help you gain critical insights. This means you can now gain access to the right information to make actionable, data-driven decisions. In a terrain that is difficult to traverse, monitoring projects by field is a difficult proposition. 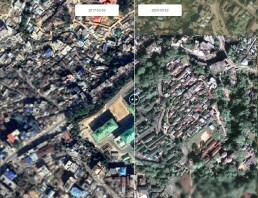 See how the Arunachal Pradesh government is using Satellite Imagery, Cloud Compute and Smartphones to stay current with infrastructure progress. We partner with some of the best companies in the world to fuse capabilities and facilitate knowledge sharing. With them, we pioneer new solutions and successfully provide value-add services and all the support you need. See what's new from our team at SkyMap Global. At SkyMap Global, we’re building the future of earth observation analytics. Whether it is making agriculture better, reducing the impact of pollution or helping prevent disasters, our solutions are focused towards helping our customers discover, analyze and visualise information. And with a highly passionate team, we build the fastest, most efficient and affordable tools and techniques to help them make the right decisions. Our team is comprised of researchers and scholars with excellent academic backgrounds and technical skills looking for smart people to join them. At SkyMap Global, you will get your hands dirty applying advanced technology to earth observation data. Ask us about our feature extraction routines powered by machine learning. Innovation through research is at the core of our business and we continue to invest by closely working with top-tier institutes across the world. Lead by example and collaborate to learn, share and solve the toughest challenges of today. Pioneer the change you wish to see tomorrow.